Preheat oven to 450°F; prepare fries according to package directions. Sprinkle with pepper. Heat oil in large skillet over medium-high heat. Add franks; cook 3 to 5 minutes or until franks are brown and slightly crisp. 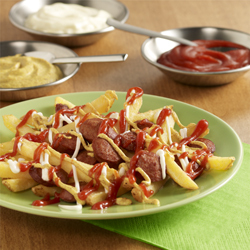 Divide fries evenly; place a serving of franks on top of fries. Serve with ketchup, mayonnaise and mustard.